Autumn/ Winter 2013 is here and its time for new pair of booties to fill in my shoe closet. As you know from my previous posts, I love Bianco Shoes and most of their models so of course my next purchase was there. 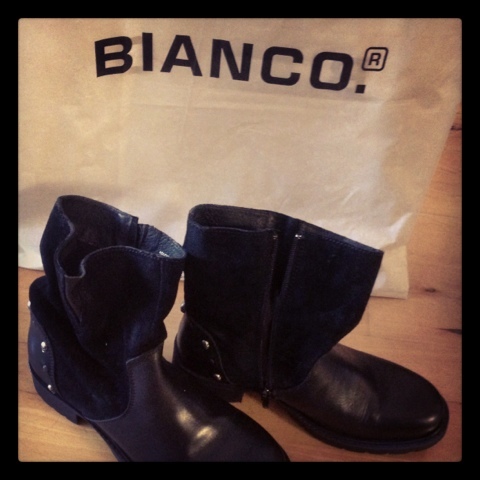 I took an advantage of great price for these booties from Bianco. I love them. I usually don't like so much this casual style and prefer some some feminine platform booties or small heel, but those babies are so comfortable that I could make an exception. What do you think about this style and is it something you would wear? Here is a selection of some of my favorite items from the new Bianco Footwear collection. You can actually choose between very small heel and a little bit higher-and more elegant. Any favorites? I, personally, love the first two pairs! And don't forget to follow the blog on Twitter and Facebook. I'm in love with your new boots! I do love biker boots, and the soft upper is a perfect addition. I need something like this in my life too! A mi el estilo casual si que me gusta, porque puedes ir bien arreglada con cosas cómodas!! !